I must admit, Halloween isn’t as big a thing in the UK as it is in America. It’s becoming more popular now but it seems to becoming more so. When I was growing up it wasn’t a thing at all so I don’t really have any Halloween memories. The only Halloween memory I have is dressing up as a witch (I.e. putting a black bin bag over my head) and going out trick or treating with a friend. His dad had spent ages carving out a pumpkin for us but as we walked down the stairs from his house we dropped the pumpkin and it smashed to smithereens! We had a strop and didn’t bother going trick or treating! To be honest I’ve hated the thought of trick or treating. This is because of the small idiotic minority who think it’s ok to scare old people. When Taid was alive I would go up to stay with him on Halloween so that no one could take advantage of him. Especially since he probably wouldn’t understand the concept of Halloween. 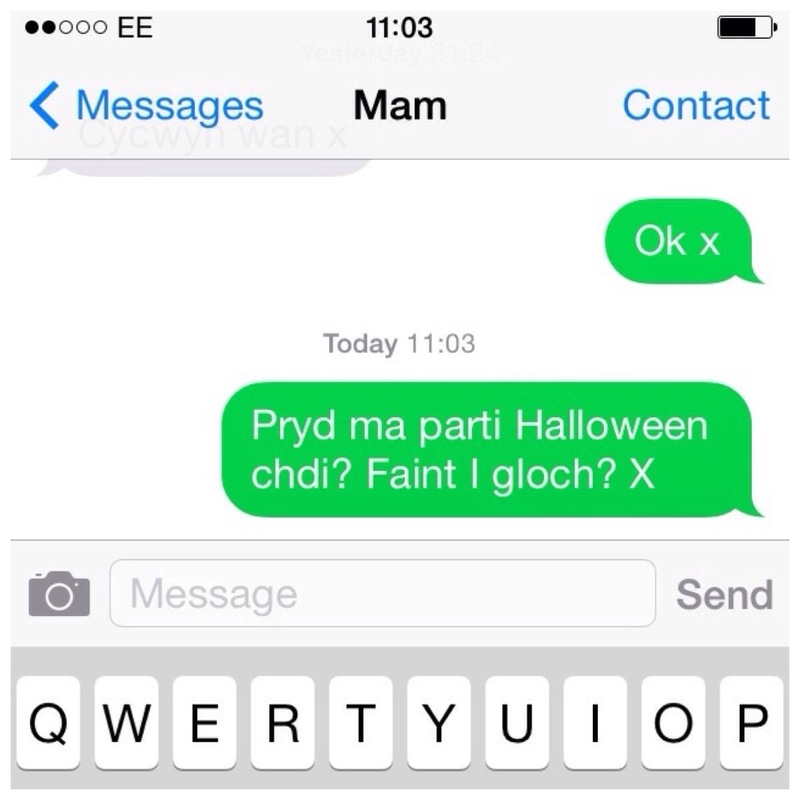 Here’s a text I never thought I’d be sending – asking my Mam when does her Halloween party start!!! My Mam having a Halloween party?!! Unheard of! It’s at her work and we’re going to go to support. So I now have a reason to dress Little Miss up in a costume! Hubby wants her to go as Yoshi! However I haven’t found one for her yet so I’ll let you know what she’s dressing up as when we get a costume!! Are you into Halloween? What is your best/worst memory of Halloween? haha thats so fun! glad you’re celebrating! My first Halloween in England I got a bit creeped out – because as you know it’s not a huge thing there, so you don’t see the oodles of young tots wearing sweet princess outfits or little cowboys and Disney characters running around that I had been used to. But instead you get really ghoulish and scary costumes on the people going to the few Halloween parties and raves. Lots of blood and gore and death. NOT my favorite part of Halloween!! Yup exactly why I hated Halloween when Taid was living on his own. Can be quite scary! Hardly ever see little tots running around!